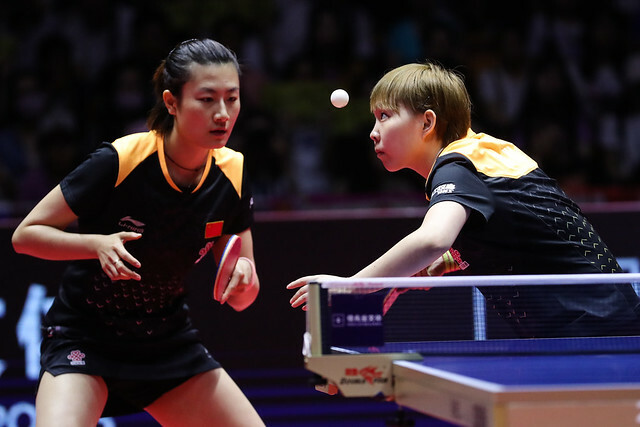 Progress for the leading partnerships; the seeded combinations with just one exception, safely negotiated the opening round of the Mixed Doubles event at the Seamaster 2018 ITTF World Tour Platinum, Kaisa China Open on the morning of Thursday 31st May. Furthermore, the one exception was hardly an upset. Hong Kong’s Ho Kwan Kit and Lee Ho Ching, the no.5 seeds, experienced defeat at the hands of the host nation’s Zhang Jike and Wang Manyu (7-11, 11-9, 9-11, 11-6, 11-8). Defeat for Ho Kwan Kit and Lee Ho Ching in a full distance five games encounter, for their colleagues, Wong Chun Ting and Doo Hoi Kem, the no.2 seeds, it was the reverse scenario. They emerged successful in five games; they accounted for the Romanian combination of Ovidiu Ionescu and Bernadette Szocs by the narrowest of decisions (9-11, 11-5, 9-11, 11-6, 11-9). A close call for Wong Chun Ting and Doo Hoi Kem, for Japan’s Masataka Morizono and Mima Ito, the top seeds, as for Chinese Taipei’s Chen Chien-An and Cheng I-Ching, the runners up at the Liebherr 2018 World Championships in Düsseldorf and the no.3 seeds in Shenzhen, life was less fraught. Masataka Morizono and Mima Ito beat Germany’s Ruwen Filus and Han Ying (11-6, 12-10, 11-4), Chen Chien-An and Cheng I-Ching accounted for Slovakia’s Lubomir Pistej and Barbora Balazova (11-4, 11-3, 10-12, 13-11). Disappointment for Germany but there was success, Patrick Franziska and Petrissa Solja, the no.8 seeds overcame the Spanish combination formed by Alvaro Robles and Galia Dvorak, a four games verdict was the order of proceedings (11-8, 14-12, 8-11, 14-12). Differing fortunes for Germany, for China and Korea Republic, it was success upon success. Lin Gaoyuan and Chen Xingtong, the no.6 seeds, delighted the Shenzhen crowd by beating Belgium’s Cédric Nuytinck and Lisa Lung (11-3, 11-3, 11-7). Meanwhile, for Korea Republic, Lee Sangsu and Jeon Jihee, the no.4 seeds, overcame Austria’s Stefan Fegerl and Sofia Polcanova (11-7, 11-7, 8-11, 11-8); Lim Jonghoon and Yang Haeun, the no.7 seeds, ended the hopes of Chinese Taipei’s Chuang Chih-Yuan and Chen Szu-Yu (11-4, 11-5, 14-12). The quarter-final matches will be played later in the day.